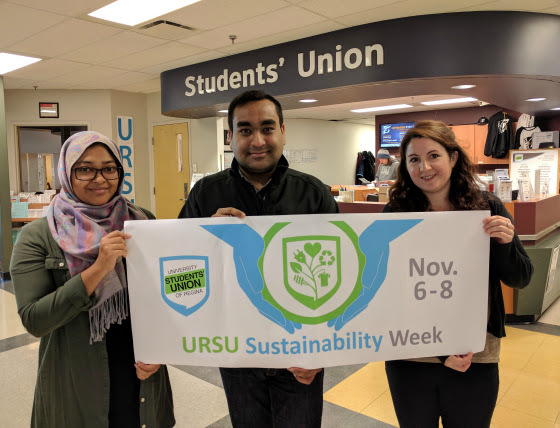 By Costa Maragos Posted: November 5, 2017 10:00 a.m.
As it prepares to launch Sustainability Week November 6 – 8, the University of Regina Students’ Union can be proud of a first in Canada. URSU has been declared as the first, fair-trade certified students’ union in Canada, designated by the organization Fairtrade Canada. Only one other workplace in Saskatchewan, The Saskatchewan Council for International Cooperation, has earned such a designation. Fairtrade Canada is a national, non-profit fair trade certification organization working to ensure Canadian products bearing the ‘fairtrade certification’ meet international fair trade standards. The fair-trade designation comes as the students’ union prepares to launch its Sustainability Week. On Monday, November 6, the public is invited to see the documentary An Inconvenient Sequel: Truth to Power at the Education Auditorium (EA 106.1) at 7:00 p.m.
On Tuesday, November 7, a composting workshop will be held by Karen Allan of GFL Environmental Inc. in Regina. Allan is a certified compost facility operator and a certified master composter. She will teach participants on how to easily and effectively compost organic waste and touch on different methods of backyard composting, vermicomposting and the do’s and don’ts associated with both. On Wednesday, November 8, a sustainability seminar and panel discussion will be held at 7:00 p.m. in the Classroom Building Room 126 (CL 126). The students’ union continues to seek donations for its URSU Threads program. You’re encouraged to bring any gently used professional attire (male/female/gender neutral) which are provided free to students. The program started in September. Clothing donations will be accepted at the Riddell Centre November 6 to November 8 between 11:00 a.m. to 3:00 p.m.
Sustainability Week is sponsored by SaskPower, Dress for Success Regina, U of R Career Centre, Enactus Regina, U of R Team Compost, URSU Threads and the University of Regina Students’ Union. Visit here for more information on Sustainability Week.